In a league entirely of their own, Belphegor stand tall in the Black Metal arena. Pumping the brakes creatively since their 2013 effort Conjuring The Dead, the Austrian heathens back pedalled to focus their reach on fine tuning a select amount of songs rather than pumping out mediocre sounds. Revealing slowly but surely that their new offering would be titled Totenritual once more the world was swept under their blackened spell. In keeping with their classic songwriting, the order of the day here is simplistic, yet effective riffs. Proceeding one of the many satanic style sound bites “The Devil’s Son” is a perfect encapsulation of the Belphegor make up. “Spell of Reflection” by contrast is more of bouncing rhythm featuring an interesting guitar solo. Despite their straightforward approach, the atmosphere that is created in Totenritual is once of malevolence, forming a dark undertone of dread throughout. Yet just as the band might be ferociously fast they can also be lumbering in a slower pace. The slow moving “Totenkult – Exegenesis of Detereoration” creeps towards the listener. Worth noting that appearance of guitar solos has multiplied since their last release, this gives the record some more variety as the usual straight riffing affair can get a little tedious when it’s on its own. The eerie atmospherics of “Embracing A Star” feature the perfect use of an acoustic guitar to create an ominous undertone surrounding the track. 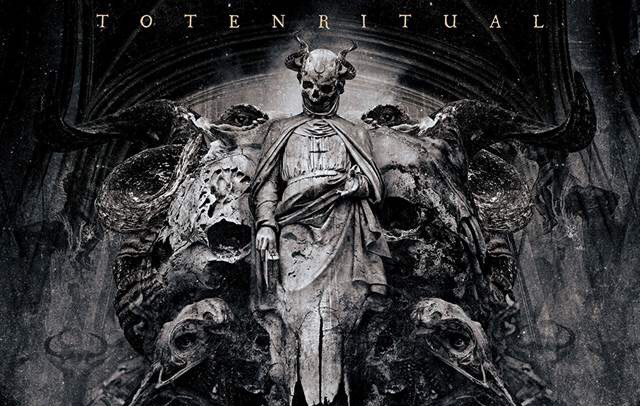 Which is then segwayed into final title track “Totenritual” which finishes off the record with a more impactful atmospheric section than just more riffs. Building on their classic sound, Totenritual is a record that encompasses all of the best components that make up the band’s Blackened Death sound. Cutting the fat, the band have put forward nine tracks that are far superior than their previous outputs. Understanding that less is more, simplicity is Belphegor’s ally here. A fantastic introduction to the band and an evolution that will have fans coming back for more, Totenritual could well be their best release yet. You can pick up Belphegor’s brand new album here before its September 15th release via Nuclear Blast.